At the funeral of Simon (Peter Althoff), one member of his family is noticeably absent from the service: his brother Peter (Mads Althoff). Peter’s other brother, Johannes (Bjørn-Andersen), and his sister, Esther (Vanglund), go to look for him. They find him in the toilets, snorting cocaine. He and Johannes argue, but Peter is dismissive when Johannes tells him the family is through supporting him with his drug problem. Johannes and Esther return to the service; Peter continues to take cocaine. With the drug affecting him substantially, Peter makes his way to the service. When he does he finds scenes of carnage, with everyone under attack from the newly risen dead. Scrabbling away he seeks refuge in another room and is joined by Johannes, Esther, and their younger sister, Maria (Stidsen). Johannes finds a trap door and they all follow him down into the room below; in the process, Peter blacks out. When he comes to, he finds they are trapped in a small room beneath the church, and with no safe way out. Maria has been injured and with no way for her to stem the bleeding, Esther cradles her as she dies. While the two brothers argue about what to do, Maria comes back to life and attacks Esther. Peter and Johannes restrain her but have little option in the end but to kill her. The shock of it all has a terrible effect on Esther and she retreats into her own mind. Peter takes control of the situation and they leave the room, finding themselves in a maze of underground corridors and rooms. Coming under attack from the undead at almost every turn, they fight their way to ground level but become separated, leading each of them into confrontations that will decide their eventual fate. A very, very low budget exercise in zombie terror, Opstandelsen is a compact feature that works better as a calling card to the industry than as a fully realised project. The decision to shoot this as a short film was a wise one, and shows just how padded out by endless running around in tunnels/corridors/woods other horror movies have become. It also helps the movie hit an above average number of dramatic high points, with the beleaguered trio facing (and fending off) attack after attack in their efforts to escape from the church. The low budget necessitates some inventive responses to the challenge of presenting a church-bound zombie apocalypse, and while some work very well indeed – Maaløe’s fire and brimstone preaching from the pulpit (and practically blaming everyone there for what’s about to happen), an attack on Johannes through a door, Esther’s confrontation with her mother (Tirkov) – there are others that don’t, most notably the use of camera lights as the only form of illumination during a chase sequence below ground. The editing is determinedly choppy during several of the attacks and it’s difficult to work out just what is going on (it gives the impression that some of the zombie make up and effects weren’t that great during those scenes). It’s a shame, as these scenes would otherwise be quite effective at adding further energy to a movie that wastes little time in putting its main characters at risk and showing in gory detail what can happen to them. There are things to be said for briefly introducing characters before letting the action take hold, but here it does lead to some problems, the main one being the way that Peter shakes off the effects of some very excessive coke-snorting to become as focused as he does (either he’s very used to it or the cocaine wasn’t as pure as it looks). And the way in which Johannes earnestly prays to God for protection – giving the impression he may fold under the pressure – isn’t followed up or allowed to get in the way of his subsequent heroics. Otherwise, the narrative follows a fairly standard formula, whittling down its cast until there’s only one survivor, and leaving things open-ended as to where the story might go next. With a strong, heavily stylised visual aesthetic in play, Opstandelsen is often potent stuff, with its gruesome splatter effects used sparingly and with unflinching attention to detail, leaving the unprepared viewer to deal with some purposely raw and violent imagery; fans, however, will lap it up. Haugegaard drives the action forward, making the movie a kinetic treat, allowing only the briefest of pauses once the trio leave the room below the trap door. Some of the more violent, dramatic scenes are abetted by having Lasse Elkjær’s pounding score jacked-up in volume, and the soundtrack is beefed up as well, making all the lip-smacking zombie sounds that much more appalling to hear. As an attempt to further highlight the awfulness of what’s happening, it’s unnecessary, but it does fit in with the movie’s unsubtle, in-your-face approach to the material. 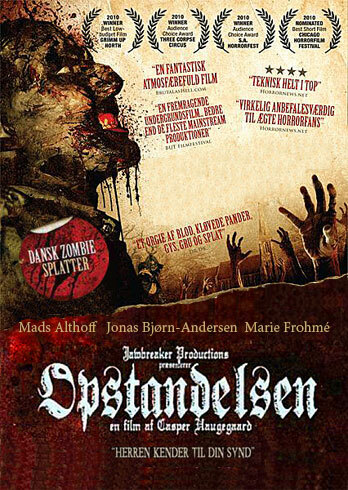 Rating: 6/10 – very rough around the edges, and with performances that are perfunctory if not memorable, Opstandelsen is a short that bodes well for Haugegaard’s future projects; seriously grim and grisly throughout, fans of zombie movies will find much to enjoy even if the storyline offers very little that’s new.